For however powerful and intriguing the play Time Stands Still was, it left us unsatisfied. Alas. Ostensibly dressed up as a topical drama about a traumatized photo-journalist, Sarah (a graceful, fiery Laura Linney), freshly returned from Iraq, it covers instead a much larger issue of postcolonialism, justice and white guilt. It doesn't go into the nitty gritty surrounding the politics of Iraq or Afghanistan (as we had expected it to), nor the debates around humanitarian aid; its scope is less political and much more philosophical and, to its detriment at times, vaguer. Sarah and her partner, James (Brian D'Arcy James), are both damaged adrenaline junkies - forever chasing the next war zone, the next famine, dancing with death and flirting with notions (delusions?) of grandeur. Does their work mean anything? Does anyone back in the "developed" world actually notice Sarah's pictures or James' essays? When they turn Sarah's latest visit to Iraq into a glossy coffee table book, are they "profiting from the suffering of others"? (Sarah's words.) They are a dark, brooding pair given to an epic sense of significance: even as their romantic lives get mixed up and similarly scorched by their war zone wanderings, it's something they have great difficulty living without. They are, they feel, doing something very important. Which is not the case for their close friend and photo editor, Richard (a rakish Eric Bogosian), who - while admitting to "living vicariously" through the duo's adventures - feels likewise shaken by their breakdowns and near-death experiences, eventually swinging around the spectrum to a philosophy of embracing vitality and comfort, debauched West or not. His new love, a young event planner naif named Mandy (Christina Ricci), is both a point of derision between the three old friends and a testament to Richard's dedication to his new life. No more hunting for suffering. There's no doubt that Time Stands Still is very good - the interplay between the characters is dynamic, energetic and smart. While they risked becoming caricatures - especially Mandy - the writing respected their various positions, and they all played important roles in presenting these "options" for the liberal mentality. How guilty are we supposed to feel for the suffering of those in absolute poverty? Or in war? How responsible is the West for these disasters? These are thorny topics, and the play does a great job of, for example, establishing an uneasy (and funnily Brechtian!) parallel between the escapism of Hollywood horror movies and the "escapism" of going into a land of suffering and documenting it (and the escapism of watching a play about these escapisms). There's this sense of intrusion - Sarah has a great monologue about this, when she describes a PTSD flashback about a market bomb in which she was urged by a wounded woman to "Go away! No pictures!" - and there's a concurrent sense of detachment, of hiding behind a lens (or a coffee table book), all in the (noble?) name of atonement for past geopolitical grievances. Is it wrong that (1) we think Eric Bogosian looks like Anthony Bourdain, and (2) this renders him hot? We felt unsatisfied, though, because the play spent so much time setting up this complex, layered look at the effects of living in a powerful white hegemony on white people - just how guilty should white people feel, as humanitarians? as liberals? etc. - but then gave essentially no answers. There was even a scene in which James and Sarah have a raging fight about each other's "imperialist" attitudes, and how even their romantic entanglements carried tinges of exoticism and Orientalism. This is a scathing remark - and it's a very valid argument. Yet it is never pursued; the writing backs away from really damning Orientalists, or damning people who damn Orientalists. We think partly this had to do with the playwright (Donald Margulies) never criticizing Sarah as much as he could have - and perhaps should have. Despite the writing's nominal criticism of Sarah's less virtuous motivations - her trust fund baby guilt, her romanticizing of "adventures", the obvious, self-important pride - it never really undermines her. As a result, the audience never gets an opportunity to really question her role in the same way the other three are questioned. A little more subversion would have gone a long way in challenging us to think more deeply about these issues. At the moment, we were left only with the questions, and no options given as answers. Nonetheless, it was an amazing opportunity to see the absolutely lovely Laura Linney on stage! She was really fabulous, and gracious to her adoring legions who waited by the cast door later. Christina Ricci did a great job keeping the humanity in her borderline cartoon character; and we may have a crush on Eric Bogosian now (BUT WHATEVS MOVING RIGHT ALONG). Brian D'Arcy James had some strong moments, but we had a hard time finding consistency in his performance. 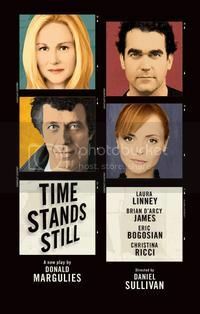 Time Stands Still is playing at the Cort Theater in New York. Also, we think Saviors and Survivors might be an interesting companion to reading/seeing this play.